Vivacious village soumak from Soviet Dagestan in the Caucasus Mountains. This soumak was woven in the Dagestan Autonomous Soviet Socialist Republic, the official name, by mountain tribal people for local use. Often these spectacular home weavings are given as a wedding dowry. 1960s. Exact size, including wool fringes, is 10 ft. by 5 ft. 8 in. This soumak (several spellings are used) is in excellent overall condition with limited minor wear. This one appears to have been used primarily as a wall tapestry, which is not unusual in homes in the Caucasus where they are especially treasured. No holes, repairs, odors, etc. It is 100% natural sheep’s wool and environmentally friendly. The overall medallion geometric design is very traditional; however, the addition of pictorial elements such as birds is an uncommon treat. Sumaks are similar to kelims but the thread work for the embroidery is not cut tightly on the back side. (Last photo with Morgan silver dollar shows the back.) They are more durable than kilims for the most part. This is not a Turkish, Afghani, or Chinese version of a soumak. This is an authentic Caucasian soumak. “In technical terms, Soumaks are flatwoven rugs. 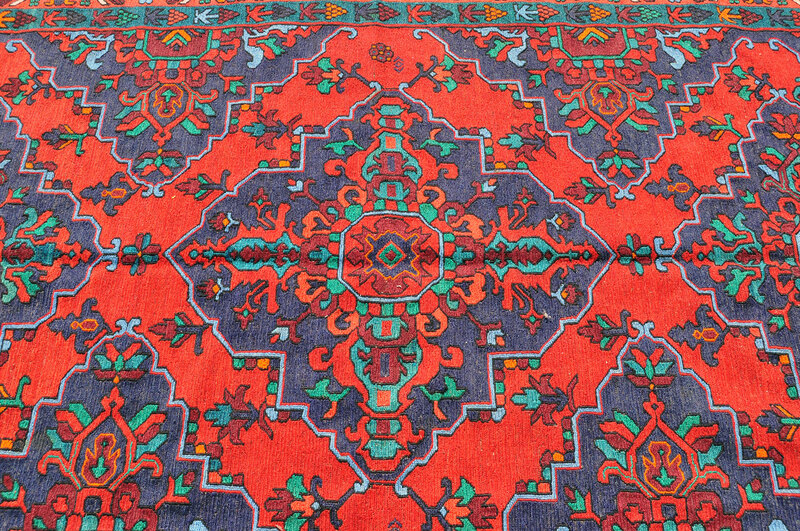 Their technique is related to that of kilims, but it is somewhat more complex, thicker in handle, and more durable as floor covering. As opposed to Kilim technique which consists of compacted weft facing simply running over and under the vertical wraps, Soumak weave runs the yarns around the warps in a serpentine pattern, over two, back one, over two back one, and so forth. The rows of this yarn facing or brocading are then separated by wefts like the rows of knots in pile carpets. This is not a true pile rug so not really suited for a super high foot traffic area of the house. I would recommend a quiet living room, office, den or bedroom. (It could also be hung as a tapestry.) A simple rug pad, cut to fit and often a thin mesh, would help keep it aligned on slippery floors. The sumak is $649. Shipping will be around $40 and pickup is free. Please email me with questions or to make purchase arrangements. Thank you.